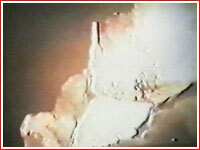 The Emergency Escape System, SAS, fires on Sept. 26, 1983, saving lives of two cosmonauts aboard the Soyuz-T spacecraft as its launcher explodes below. In 1961, Department 11 of OKB-1 started preliminary design of the emergency escape system for the future Soyuz spacecraft. 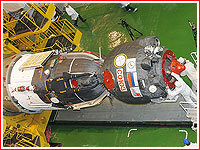 During previous work on the Vostok manned capsules, as well as later on the Voskhod, engineers accepted the fact that a major malfunction during initial phases of the launch would make a rescue of the crew either unlikely or completely impossible. 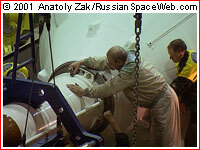 However, the original goal of the Soyuz project called for the development of ways and means of rescue during the full length of a ride to orbit. The most challenging failure scenario, which ultimately determined the design of the emergency escape system, was the explosion of the rocket booster right on the launch pad. In such situation, ejection seats could not guarantee either a safe distance of escape from the exploding rocket, or reliable protection from its falling debris. 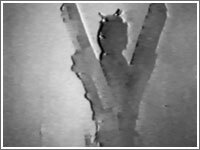 In 1962, Korolev's engineers studied the problem in cooperation with a team from Flight Research Institute, LII, led by N. S. Stroev. The work showed that the most efficient rescue would be achieved by pulling the crew capsule from the rocket with the help of dedicated solid propellant rockets and then landing the capsule as in any nominal mission. A prototype of such system was tested at the Flight Research Institute, LII, lab led by Guy I. Severin. The tests validated the concept. Developers concluded that the escape with the help of a rocket would be necessary only during the flight in the lower denser layers of the Earth atmosphere, when the loss of control over the rocket would likely lead to its disintegration and explosion. At the same time, available statistics showed that beyond Earth atmosphere, the likelihood of rocket explosion was minimal, therefore a nominal separation of the reentry capsule with a following landing was adopted as a primary escape method. During 1963, engineers at Department 3 and 11 of OKB-1 with support from Department 15 led by K. D. Bushuev and S.S. Kryukov developed structural design of the "Jettisonable Emergency Escape Head Section" known by its Russian abbreviation as OGB SAS. 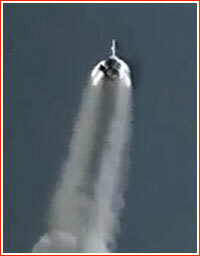 This work was also coordinated with the branch of OKB-1 in the city of Kuibyshev (now Samara), which at the time took over all development and production of the R-7-based launch vehicles. Developers conducted an analysis of possible emergency flight scenarios in order to determine necessary capabilities of the escape system and its flight profiles. In addition, engineers had to adjust the design of the main parachute system, so it could be used in the aftermath of the flight on the emergency rocket. All specifications for the emergency escape system and its effects on parachute and landing systems were formulated in 1963. 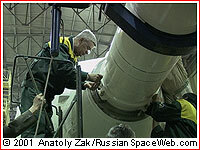 Necessary systems capable of identifying such problems were added to the design of the launch vehicle intended to carry Soyuz. In the meantime, the spacecraft itself received a special sensor of weightlessness, which if detected earlier then expected in the nominal flight, could also trigger an emergency escape rocket. In 1965, developers of the escape system stumbled upon a new serious problem. As it turned out, collision-free separation of the entire payload fairing from the service module of the Soyuz (which remained on the rocket) was practically impossible. After a series of brainstorming sessions, engineers split the payload fairing into top and bottom sections. In the emergency, the top section would fly away with the escape rocket and the crew compartments, while bottom section, surrounding the service module, would remain on the rocket. To increase the aerodynamic stability of the shortened escape vehicle, it was equipped with four folding stabilizers. During 1966 and 1967, the escape rocket flew two test missions, lifting the escape module from the ground. 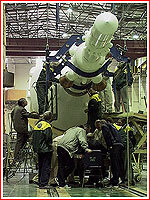 In one of the launches, excessive acoustic loads of the firing escape motors, blew out sections of coverings between top structural beams of the fairing. 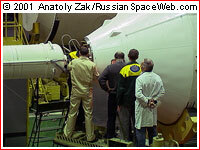 To fix the problem, the top section of the fairing received a layer of thermal protection. As early as 1968, OKB-1 started developing a new version of the emergency escape system, which would eventually become part of upgrades of the Soyuz T spacecraft. 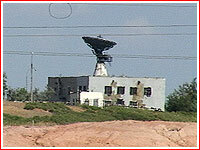 Department 241 led by V. A. Timchenko at OKB-1 was responsible for the escape system and landing systems. Beginning in 1974, a special laboratory 179, led by V. A. Ovsyannikov took over the responsibility. The new version of the escape system promised higher reliability, and it could fly higher and farther thanks to the new solid-rocket motor developed by Iskra plant in the city of Perm. The new escape rocket also allowed Soyuz to use the main parachute during landing, instead of a less reliable backup parachute. To guarantee a safe landing of the reentry capsule far away from the launch site, the new system could take into account wind characteristics, while selecting an optimal escape trajectory. To provide an escape during a short period after jettisoning of the emergency escape rocket, but before the separation of the payload fairing, which previously had no immediate escape scenario, two pairs of solid motors were placed on the fairing. In turn, this upgrade allowed to drop the main escape rocket 123 seconds after the launch, instead of previous 160 seconds, thus compensating for added mass of the new escape system. Another major improvement included an addition of a second tier solid motor above the original one. In case of a fire on the launch pad it would activate to increase the altitude of escape, while in case of trouble at high altitude, where the escape module has less stability, it would play a role of a stabilizing mass. In a new round of flight testing, traditional firing of the escape rocket, imitating escape from the ground was made more complex. 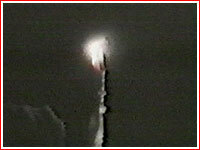 It was designed to replicate the failure of the rocket after separation of the main escape rocket, known as Flight Phase 1A. For this purpose, a test vehicle was equipped with two engines, which played a role of a rocket booster. They lifted the craft to the altitude of 2.5 kilometers, where after separation of the head section, Phase 1A escape scenario was rehearsed. 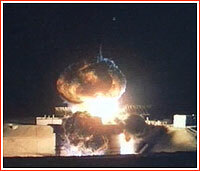 In real life, the system proved itself, when it saved lives of two cosmonauts during fire and explosion of the launch vehicle on the launch pad in 1983. The Iskra plant re-designed escape rocket one more time to contribute into weight-saving efforts during the development of the Soyuz TM version of the spacecraft. 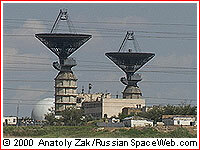 It entered service after the launch of the Mir space station. Two core engines -- central and add-on engine -- were replaced with a single one-chamber engine. 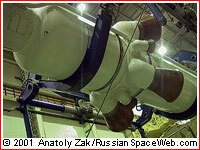 Both chambers would burn along the same profile but using a unified nozzle. The redesign significantly cut the weight of the escape rocket. The main diameter of escape rocket was also reduced, further improving aerodynamic qualities of the entire escape module and reducing the mass of the balancing weight. 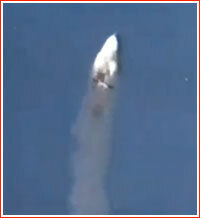 The nominal separation time of the escape rocket was further advanced to 115th second after the launch (52) (to 114th second according to another source 243). That change freed more weight for payload and enabled to combine drop zones for the escape rocket and boosters of the first stage in the same area downrange from Baikonur. Total weight savings from the redesign of the escape rocket and its flight profile reached around 60 kilograms. The escape motor would be installed on top of the payload fairing. 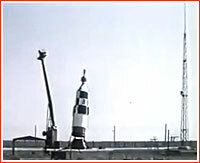 Prior to launch, the emergency escape tower would be calibrated relative to the vehicle's center of gravity. In case, the main rocket would deviate from its standard attitude, the flight trajectory of the escape module could be adjusted accordingly with the help of its own gyroscopes and dedicated solid-propellant thrusters. During a normal flight, three "floating" struts on the payload fairing would simply "follow" the structure of the spacecraft inside it. However, in case of emergency they would be instantly fixated to the lower structural ring of the reentry vehicle, thus transferring all loads from the payload fairing, during the escape flight. The main escape motors would then fire for 2-6 seconds (2), pulling away the top section of the vehicle, including habitation module and the reentry capsule with the crew from the rest of the rocket. 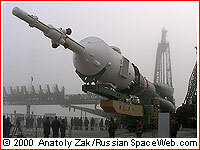 The instrument module of the Soyuz would remain with the rocket. 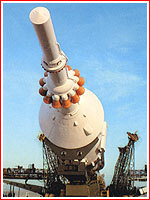 After the OGB SAS stack reached a safe distance from the failing rocket, the reentry capsule would be disconnected from the fairing and a separation motor would fire, allowing the capsule with the crew to slide away from the bottom of the payload fairing, like a bullet from a rifle. A normal landing under a parachute would follow. The same solid motor would be used during a nominal flight to separate the emergency escape tower from the rocket. 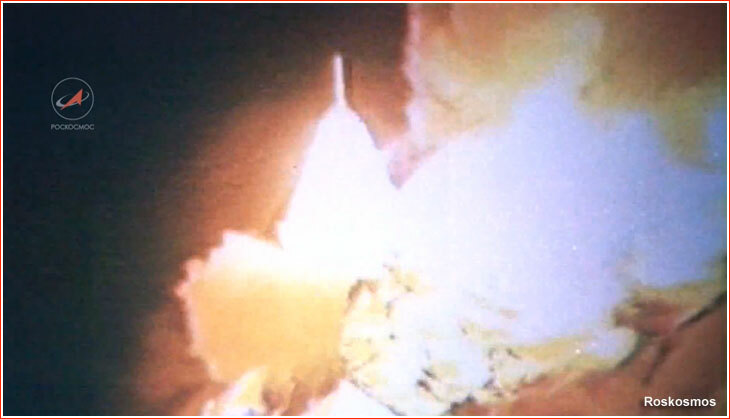 The emergency escape system of the original Soyuz spacecraft fires during a live test. A second-generation emergency escape system, borrowed the design originally proposed for the L1 circumlunar project. 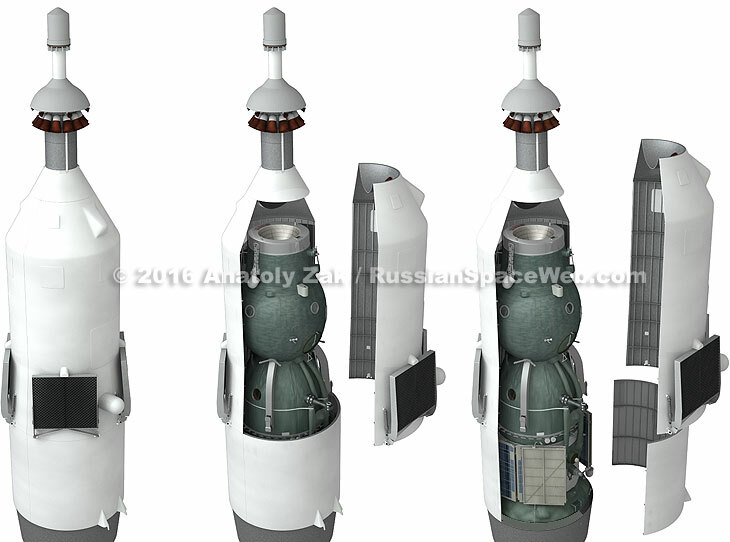 It was initially intended for the Soyuz T spacecraft, but was first flown during the Soyuz-19 mission under the Soyuz-Apollo project. Flames engulfed all but the top of the rocket tipped with the emergency escape tower, as launch control officers on the ground scrambled to activate escape system. The emergency escape system pulled away the spacecraft, while conflagration raged beneath.